The ProBarrow s 800watt drivetrain carries heavy loads over rough terrain and steep hills with ease and the large capacity drum means you are not only going through obstacles with less time and effort but you are moving 30% more material with each trip! Turn one of the most labor intensive and dreaded tasks on the jobsite into one of the easiest. The ProBarrow s handle design is balanced so that even full loads of concrete feel weightless in your hands and with 500lb Uphill capacity all you have to do is steer! Unmatched Power, Durability and Ease of use! ProBarrow was built tough for Contractors, and electric power means instant on, always ready to work, without the noise, fumes and hassle of starting a loud distracting gas engine. The advanced digital controller has the advantage of full variable speed control and forward / reverse switching all on the same lever. This leads to incredible control and very intuitive ease of use. 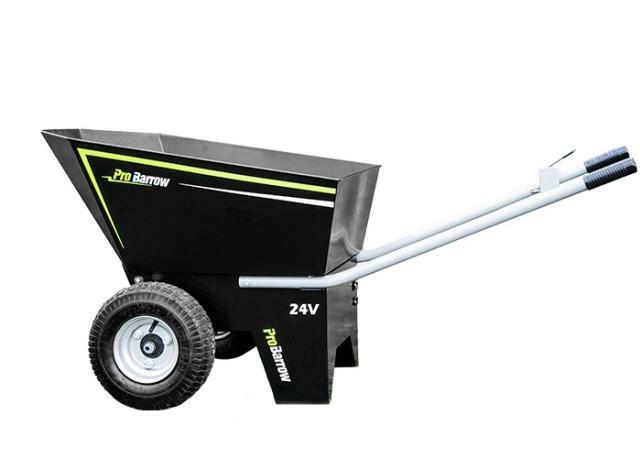 * Please call us with any questions about our wheelbarrow electric 500lb rentals in Bellevue WA, North Bend WA, Renton WA, and the Seattle Metro Area.